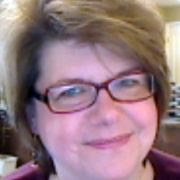 This week's guest for Flooring The Consumer's Social Media Series: Bridging New & Old is Beth Harte. Beth Harte exudes passion and connection. It's palpable on her blog, The Harte of Marketing, in her posts at Marketing Profs’ Daily Fix and also in her role as Community Manager for MarketingProfs. 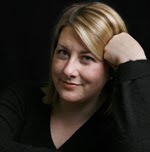 She connects people and ideas, not just in person or via email, but also via Twitter [@BethHarte], on the MarketingProfs LinkedIn Group and Facebook Fan Page, on blogs - and anywhere else where relevant conversation takes place. Inevitably, she nurtures the conversations and interactions and adds unexpected perspectives. Beth also bridges conversation with discipline. Take her recent online seminar for the MarketingProfs Summer Series: Getting Buy-in with Social Media Measurement: Don't Sweat the Small Stuff. Yes, it was packed with insight and sound perspective on her social media experiences, but she also brought up the structured and strategic thinking that marketers need to put into practice for success. For that matter, check out her posts on The Search Engine Guide Blog. Beth Harte is a consummate PR professional who launched the weekly PR 2.0 Chat on Twitter back in May 2009 [ look for #PR20Chat on Wednesday evenings from 8-9+ pm EST.] She and others moderate the discussions that range from the nature of public relations 2.0 to branding to measurement to... Have you checked it out? In addition to her roles as marketer, blogger, speaker, communicator, thinker, connector (people & dots), Beth is also adjunct professor at Immaculata University. I can imagine how thought-provoking her classes are! C.B. : Beth, how and why did you get involved in social media? Beth: I’ve always been a really social person and my claim to fame in school was always the one being caught for passing notes! Not much changed in college, graduate school and my career. Well, except the getting caught part and the fact that now all of those notes are electronic. In 2004, I joined a couple of online Yahoo! Groups dedicated to one of my favorite brands, Hermès. And yes, believe it or not, there are about three online communities dedicated to the brand. Joining these groups was my first exposure to “social media/networking.” We didn’t call it social media/networking, it was just a group. I got involved in the groups because I wanted to learn more about the brand, the scarves, the artists who designed the scarves, etc. and within the group I could do it freely. As well, at the time brands like Hermès didn’t participate in social media so other people were the source of knowledge about the brand. Being engaged in social media as a brand enthusiast and consumer versus a marketer gave me a TON of insights that I would have never been able to get as a marketer. That’s why I always suggest to marketers who want to really understand social media that they join a community, group, or forum based on a hobby, brand they like or sport. Doing so forces you to engage as a ‘person’ rather than a corporate or brand talking head. As well, the interesting group dynamics are really visible when you are interacting as a person. You learn who the opinion/thought leaders are, who the trouble makers are, who the fun people are, who the tolerant people are, who the helpful people are, etc. Understanding sociology as well as marketing is a definite plus when it comes to engaging in social media. We also met as a group offline too for lunches, shopping, etc. It really helped solidify relationships with each other and sales associates in the Hermès boutiques. And no matter where you were in the country/world, there was always someone to meet up with! I started blogging in 2006 because it was a way for me to share my thoughts, opinions, experiences, etc. It was a non-marketing blog, which was a great precursor to my current blog, The Harte of Marketing. Beth: Social media (the tools) like Twitter, groups, blogs, forums are my conduits to meeting people, learning, and sharing. I have met so many great marketers from all over the world, it’s really amazing. Social media (the concept) for me is about being free to be me in a way that’s natural to me. Like I said, I’ve always been a social person so, to learn that it’s okay to be professional and personable at that same time is refreshing. I don’t separate “Beth Harte the marketer” from “Beth Harte the person.” They are one in the same and I appreciate being able to speak like a “human” vs. corporate marketing speak. Beth: What I struggle most with social media is that it gets represented as replacing traditional marketing or that it’s an all or nothing option. I don’t believe either is true. When people talk like that, it really makes me wonder if they understand business or marketing. I am also often frustrated by people who liken social media to just another channel where marketing messages can be dumped. This might work for some brands, but when I hear about brands that ignore people trying to reach out to them, it really makes me wonder what their motives are for engaging in social media in the first place. Beth: It hasn’t. I guess I am a marketing purist... But when my very first marketing professor drilled into my head “know thy audience” I took it to heart. And the only way you can know them is to speak with them (and I don’t mean marketing research). I’ve always been a huge proponent of interacting and getting to know customers. I am just happy that social media is finally making customer relationships and conversations the norm versus something taboo. And, of course, I am thankful to have a job where I am expected to engage/interact with members all the time. C.B. : Any other thoughts to share about the effectiveness of social media in forging stronger relations with customers and how best to do so? Beth: Keeping with the simplicity theme, I think some people want to have relationships with brands they like and spend money with. Other people could care less about engaging brands. I think it’s important for organizations to know the difference so that they know where to spend their time. I think an honest relationship, where you aren’t always seeking something in return, lends itself to customers who want to stick around longer. That said, I also think it’s important to know when to have a line in the sand. While it’s wonderful to have relationships with customers, there will always be customers who take advantage of relationships...sometimes they are right to do so and sometimes they aren’t. + "I always suggest to marketers who want to really understand social media that they join a community, group, or forum based on a hobby, brand they like or sport. Doing so forces you to engage as a ‘person’ rather than a corporate or brand talking head." + The only way to 'know thy audience' is to speak with them. + It's important for organizations to understand whether their audiences want to have a relationship or not so they know where to spend their time. For additional insights from other participants in the Social Media Series: Bridging New & Old, please visit The Entire Bridging New & Old series, which includes a link to the e-book based on the first 26 interviews in the series. Ci sei dentro originally uploaded by Könrad. When consumers didn't walk into stores with so much information, knowing more than sales associates. When sales associates were true relationship professionals, rather than order takers, who engaged customers in dialog to uncover needs, who consulted rather than forced a hard sell. When consumers had more time on their hands and social shopping outings were an ideal means of getting caught up on friendship. Interestingly, it looks like not all is lost. In fact, technology offers profound social implications for the retail experience - not necessarily as a result of the kind of scenario described in Prototype Store Checkouts Inspired by Internet Shopping Experiences [which I consider more of an efficiency enhancer], but rather because of the tools of social media that allow us to transfer and enhance the social elements of shopping on the consumer's terms. Through blogs, comments, comparisons and other new e-commerce tools. Take the tools described in Social shopping is poised for growth that "enable two or more consumers in different locations to view the same product on an e-commerce site while trading comments back and forth." Example: Charlotte Russe and DecisionStep's ShopTogether service [definitely check out the demonstration video; I'm in awe over the options available for sharing and the ease of it] which has resulted in shopping not just with friends, but also with parents, siblings and other family members. How Retailers Can Benefit From Social Media offers additional examples of retailers using social media - such as ratings, reviews, recommendations, blogs, forums and photo sharing - to "transform their Web properties into online destinations with vibrant communities" by creating a "compelling content experience" which can lead to long-term trust and loyalty. Check out Whole Foods and its forums, and Comcast's Vehix.com. Vehix.com is worth exploring. I love how clean the site it; not your typical car buying experience! Notice the ratings and reviews, and the community tab. According to a study by Ketchum and the University of Southern California's Annenberg Strategic PR Center, and described in Blogs making a bigger impact at the point of purchase, study finds, "consumers are more frequently basing their buying decisions on information gleaned from shopping Web sites, blogs, and social networking sites." That includes perspectives from peers. I love the article's characterization of Google as the "world's largest publication" because so many consumers [myself included] start their shopping at a search engine's query window. You can glean more details from the study in Survey Reveals Media Channel Lines Continue to Blur about the 2008 US Media Myths & Realities survey. Does your own personal online activity parallel any of these observations about online resources? What's your reaction? How might online and digital social add analog social to your retail experience? What are the implications? What comes to mind when I say "Deluxe?" If you think 'checks,' I'm with you. 100%. In fact that was my reaction when I received an inquiry from Deluxe to sponsor an ad on Flooring The Consumer. Next, was 'why?' I accepted the sponsorship on condition that I speak to and interview someone from Deluxe to better understand the 'why?' That's how I met Michael Benedict, who focuses on small business marketing at Deluxe, and discovered that Deluxe is more than the check company and Mike is serious about delivering value to his small business accounts. C.B. : Mike, tell me about yourself and your role at Deluxe. Mike: First of all, I really like small, independent businesses. I've been marketing to them for over 12 years, and make a real effort, professionally and personally, to find and visit independent businesses. I'm a Marketing Director for the Deluxe Corporation and focus on identifying and developing new industries. I'm working on two industries where we have a particularly strong presence - Retailing and Construction. One of the things I enjoy most is getting a list of our customers and spending a day visiting them. Recently, I spent most of a Friday in Hoboken, New Jersey on Washington Street speaking with Retailers. It's great to speak with folks directly - hear how business is going, understand how well we're serving them and figuring out how we can help them. C.B. : Tell me about Deluxe. As I mentioned to you, I think of Deluxe as the check company but it has evolved into much more than that. Mike: We are the check company. But we're undergoing a transformation to help small businesses with some of their key pain points. We've spent a lot of time listening to our customers to better understand where they need help. What they've communicated back is they need help with their marketing - especially in this economic climate. The challenge is marketing is often perceived by small businesses as complex and costly. Yet, it's so critical. With about 50% of small businesses not surviving past their 3rd year, they really need to get their name out there. They also need to think about how their current and potential customers can find them (more on this below). Deluxe has (and is continuing) to reinvent itself to help small businesses easily and affordably get and keep customers. For example, we can help them create their business logo, design and host a website, develop email campaigns and even design, print and send direct mail for them. We go further by offering personalized apparel and promotional products. For Retailers in particular, we have an extensive Retail Packaging line under our Bags & Bows brand. But we're more than just a bunch of products and services. We've taken time to tailor these products and services to help specific types of businesses like jewelers, builders, automotive repair shops, etc. We also have a wonderful, helpful sales organization that will hold a customer's hand through the process - a small business doesn't have to do this all on their own. We go further by helping small businesses understand how they can get and keep customers, by offering free white papers, educational videos and articles. One of the things I've heard again and again over the years from small businesses is they know their craft, their area of specialization -- e.g., I know how to cook great Indian food, I'm a great electrician, I know my area of consulting, etc. -- but they don't necessarily understand how to promote and manage their business. This is why we're developing content for them, tailoring it to their type of business and putting it on deluxe.com/shop for free. C.B. : Who are your customers? Mike: Mostly very small, independent businesses. We work with all kinds of businesses, whether they be an auto mechanic, florist, dentist, manufacturer or builder. C.B. : What are their biggest issues? How do you help them? Mike: Their biggest issue is getting more business. And that requires them to market themselves, ongoingly, in addition to all their other responsibilities. But it's especially critical now, and not just because of the economy. The rapid expansion of ecommerce, mcommerce [mobile commerce] and social media means even local businesses need to have an online presence. There are still a number of small businesses that still don't have websites, and that's leaving money on the table. I'll give you an example. I recently relocated to New Jersey from Massachusetts. I live in a heavily urbanized area, with a large number of small businesses. Like most people, I search for products, services, restaurants, etc. on Google. So, if you don't have a website, much less one that's optimized for organic search [aka SEO], you won't be found. I read a statistic where about 40 million Americans relocate every year. As a small business, ask yourself how people know you exist? If someone new moves into the neighborhood, how can they find you? C.B. : You’ve sponsored an ad on this blog, why? What are you hoping to achieve? Mike: I reviewed dozens of blogs and liked your focus on helping the independent retailer. It fits well with our strategy of providing more content for retailers. I also believe retailers, and small businesses in general, need to invest more in social media. Your blog's emphasis on social media is refreshing and needed! C.B. : Are you doing this with other blogs? Mike: Yes. I'm linking to the construction blog www.markupandprofit.com. It's a wonderful blog with all kinds of great advice for the independent contractor, from how to promote their business to how to manage the books. Its author, Michael Stone, is an industry veteran who has a strong pulse on independent contractors and how to help them. He just completed several educational videos and white papers for us, and has spoken at our trade booth at the JLC Live Show. Mike: It's a wonderful venue to ongoingly interact with and listen to our customers and small businesses in general. You hear their pain points. For larger companies like ours that have customers nationwide, it's a critical tool to stay in touch. We have thousands of conversations each week with our small businesses through our Inbound and Outbound call centers, so social media is another point to listen, join the conversation and offer advice. We especially like the real-time feedback social media offers - you can go out to Twitter during the day and see and respond to the latest posts. We also use Twitter @DeluxeCorp to inform small businesses of great articles, tips and events to help them Get and Keep customers. We want to provide thought leadership in this space as well. C.B. : How has Deluxe’s marketing changed? Mike: There's a lot going on! We updated our corporate branding, launched marketing campaigns that are focused on specific industry segments and re-launched our website. We're also providing more educational content like I mentioned such as webinars, videos, white papers, articles and blogs that help specific verticals market themselves. We're trying to be as close and relevant to the customer as possible. I think the biggest change though in our marketing is small businesses will see we're so much more than a check company. We can help them with so many aspects of their marketing, and they have the comfort of knowing what they're purchasing is backed by a company that stands behind its work. When I speak with small businesses, so many of them are trying to do marketing on their own, or relying on a family member or friend to help them. In the same breath they'll also tell you it's taken 6 months to get their website up and running, or that they tried to get a logo designed and we're not happy with the outcome. And they spend a lot of money in the process. It's not uncommon to hear a small business owner say they spent thousands on a logo or website design. We can help them in these arenas (and many others) at an affordable price and back it up with a strong guarantee. C.B. : What about establishing your own voice online? Do you see that happening? Mike: Deluxe is definitely expanding its voice online. You can find us on Twitter and we'll be launching on Facebook shortly. We're also in the process of setting up a blog. Stay tuned for more! Were you aware that this 90+ year old company offered such a range of services? Deluxe seems to be -- in addition to the checks -- a few parts VistaPrint, several parts GoDaddy [with whom I do most of my web-related transactions], and perhaps some PIP printing & marketing services. But also more. Do you have questions or reactions for Mike? Ideas for him to consider? Any surprises relating to marketing and small businesses? I was surprised to hear that 50% of small businesses don't survive past their 3rd year. And that marketing is as much of a challenge. No surprise about the need to be found online [that is the subject of an upcoming FCW article]. I've enjoyed my discussions about small business dynamics with Mike and comparing notes on examples of creativity and success across industry segments. I look forward to more conversations and I'm particularly eager to hear how Deluxe's marketing continues its online evolution! You can reach Mike via email at michael.benedict@deluxe.com. This week's guest for Flooring The Consumer's Social Media Series: Bridging New & Old is Sister Anne Elizabeth Fiore. Sister Anne Elizabeth Fiore is a Nun with the Monastery of Visitation, in Georgetown, which she joined in 2000 after obtaining a BA in classic languages and an MA in theology from Georgetown University. The Visitation Monastery is closely associated with Georgetown Visitation Preparatory School, my high school. That's how I 'met' Sr. Anne E. whom I did finally - although briefly - meet in person at my reunion this past April. She teaches Latin, coaches JV Softball and moderates the school's Club Dodgeball. She also manages the Monastery's vocational outreach. Now, I had heard about Sr. Anne E., starting in June 2006, at my niece's high school graduation, right before I took the blogging plunge. At that point, I knew of her as Visitation's 'blogging nun' who launched Live + Jesus about monastic musings in the tradition of Saint Francis de Sales and Saint Jane de Chantal in 2005. The blog is filled with warmth and humor and marvelous perspective on life as a Visitation sister -- a perspective I didn't have a clue about as a high schooler. Sr. Anne Elizabeth and I both participated in Blog Action Day - Poverty and highlighted the amazing work of Visitation alumna Liz McCartney, St. Bernard Project co-founder and winner of the CNN Hero of 2008. I discovered her love of puns during our email exchanges [I'm the 'carpet blogger'] and convinced her to share with us her perspectives on social media. Sister Anne E. captures 'bridging new & old' beyond making Latin come alive for 21st century students. She brings to life people like St. Francis de Sales and St. Jane de Chantal, the founders of the Visitation order, who lived a very long time ago. Not only by blogging, but also in presentations. Take Holiness and Humor Learning and Laughing with the Saints [note the Twitter feed] or Free To Obey for the Theology on Tap series. She also connects a monastery, founded in 1799, to the world of social networking, thereby broadening the reach of the order's message and appeal. Imagine, the Visitation Monastery is on Facebook, has a channel on YouTube and through Live + Jesus offers an authentic experience. C.B. : Sister Anne E., how/why did you get involved in social media? Sr AE: I’m not even sure I knew what social media was until just recently. I never really thought of “media visibility” as “social media” but given the interactive nature of blogs, comment boxes, facebook, etc., I think I understand the appellation. I got involved, as you can see, rather unknowingly in an effort to provide greater visibility for our monastery’s vocation efforts. Sr AE: I like the ease and convenience of it. With a mouse click, one can connect with – or begin the process of connecting with – a target audience of those who may be interested in religious life, those who are interested in learning more about our life in particular and those who, although not candidates for religious life, are interested in learning more about our spirituality and our daily life. Sr AE: I dislike the general milieu of this ‘no privacy’ culture. People seem to maintain no privacy; the things that are on some blogs and FB pages really belong in a journal, not on the Internet. I think it is possible to maintain a balance between sharing our life as a religious community, having my own FB account and connecting with “friends” … at the moment, 100 friends, which is about 98 more than I have in real life … but FB “friends” … and, at the same time, maintaining an appropriate level of privacy. C.B. : How has social media changed how you interact with the marketplace as a customer? Sr AE: I don’t do much “consuming” as a customer. Other than the convenience of ordering things on line .. most of what I have the occasion to order are things which relate to vocation work, visibility, etc. I might buy DVDs to burn or a new digital camera or something like that. I do read customer reviews, etc., which I guess is all part of “social media” but, on the whole, I don’t do a whole lot of purchasing as a customer. C.B. : What about religion? What resources are available to you? Are you connecting with other monasteries or religious orders? Are there other blogging sisters? Sr AE: There’s a lot of “company” in the Catholic blog-o-sphere. When we first registered our blog in December 2005 at St. Blog’s parish, there were only about 10 blogs that were in the category of “blogs by women religious or women discerning religious life” … now there are many. 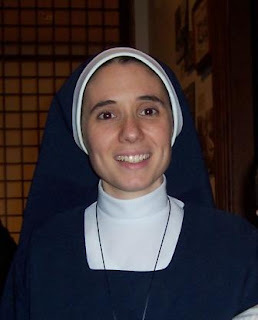 I’ve had the occasion to connect with a number of different monasteries and religious communities via the Catholic blog-o-sphere … and in one case I’ve forged a friendship with a sister – whom I’ve yet to meet in person – who blogs [see Moniales OP] for her monastery in New Jersey. We hope to meet in person one of these years. C.B. : Has that added a different dimension to your religious life? To how you interact with your students? With the sisters? How do you bridge the cultural and generational gaps? Sr AE: I can’t say that social media as added a different dimension, per se, but it calls for greater vigilance on our part, as religious, that we do not allow something – anything – to compromise how we live our religious life. It doesn’t take social media, necessarily … one could become overly engrossed with work, leisure reading, and one doesn’t have to be a religious to lose balance in life, but I think that the potential for social media to BECOME time consuming calls for appropriate and mature vigilance on the part of each religious and each religious community. I can’t say it has changed the way I interact with my students … but it does provide an opportunity to model moderate behavior: “Yes, I do use social media, I’m on FB, but I don’t spend my life there.” I think it shows them that these things – social media -- aren’t good or bad in themselves, but it’s how we use them. They’re there for our use, not for us to be consumed by them. I think also, that when people become aware of a religious presence in social media, they become interested because they are hungry for something. They’re hungry for God. There are a couple of FB ‘friends’ who write frequently for prayer intentions. That’s our job. We’re here to pray for the people of God and their needs. We’re here to pray for the Church and with the Church … and being accessible makes it easier for those who have needs to connect with us. C.B. : What 5 suggestions do you have for people to implement so they can more effectively bridge old media with new media and connect with end users? (1) Keep what’s useful about “old media” such as standards. We have become casual in how we write on the Internet, email, blogs, etc. Good grammar, good spelling, good style. Maintain good standards even if other people don’t. (2) Use the old media to access the new media. In our case, instead of taking out a big ad in the local Catholic paper and trying to tell people 10 things about our community, take out a small ad and POINT people to your website. (3) Keep your “look” the same. If your paper copy is red and black with your initials in a circle then make sure people see the same thing when they go to your website. (4) Represent yourself honestly. It’s okay to make the Internet image(s) look as good as possible, but make sure that when people who have seen you on the Internet, meet you in person, they say, “Wow! What you see is really what you get.” The best compliment from a vocational retreatant was that the pictures and descriptions on the Internet were an accurate portrait of the community she met when she arrived here. She mentioned how many communities she has visited advertised with pictures that were 10 and 20 years old. When she visited those communities what she saw on the Internet was not what she met! (5) Don’t use technology and the latest in media just because it’s new; make sure it suits your needs or make it suit your needs. Just because iPhones are the in thing doesn’t mean we need one. As monastics we don’t need our own cell phones and we don’t need updates every 5 seconds about sports, friends, news, etc. … but we can be educated about them enough to tell friends and family that there’s a free downloadable version of two of St. Francis de Sales’ works available as an iPhone application … to say nothing of iBreviary, the entire Roman Breviary in the language of your choice. We don’t need to use EVERY medium available, but we should be educated and use those which serve our outreach needs. C.B. : Sister, any other thoughts to share about the effectiveness of social media in forging stronger relations with end users and how best to do so. Sr. AE: I’m not sure I know what an ‘end user’ is … sorry, I’m just an amateur in the field of marketing. Thank you very much, Sister Anne Elizabeth! What about Sister Anne E.'s comments about managing the tools of social media? "These things – social media -- aren’t good or bad in themselves, but it’s how we use them. They’re there for our use, not for us to be consumed by them." The notion of standards is particularly relevant: "Keep what’s useful about “old media” such as standards. ... Good grammar, good spelling, good style. Maintain good standards even if other people don’t." As a practical marketer, I love the notion of "Use the old media to access the new media." How have you adapted your old media to reflect new media? What else did you identify with? Do you remember Rethinking the Mall & Uncovering Retail Creativity? Here's another angle worth pondering: what about creating truly unique, relevant, memorable experiences? How? But purposefully deciding NOT to be all things for all people. For example, opting to focus on only serving the needs of a specific ethnicity. According to Ethnic Malls Are Buzzing from 8/31/2009, malls like Kam Man Mall in Quincy MA, La Gran Plaza in Fort Worth, TX or The Great Wall Mall in Seattle, WA have created shopping environments that are bustling with customers despite the recession. These malls each serve a specific demographic whose needs aren't being met elsewhere. Not only do they sell necessities, but they also offer valuable services and a sense of community. The end result is authentic, highly relevant and memorable. It also generates loyalty. Not a bad combination. Another approach to creating an unique, relevant and memorable experience is by repurposing existing urban spaces, actively using everything that the building and space represents, to create a retail setting that reflects and engages a brand's customers. For example, Urban Outfitters Inc., which has "built an empire on knowing its customers intimately - then growing with them," routinely takes over pre-existing spaces, repurposing them without stripping away all of the history and character. The end result delivers no two stores that look or feel the same way and an experience that customers seek out because each is unique. Given the frustration inherent to dealing with too many choices and the resulting extreme complexity, consider an unique, relevant and memorable retail experience based on simplicity! Become a curator as suggested in Sales Down? Time To Dial Down The SKUs [also see Refocus Product: Retail As Curator & Less But Better.] Imagine offering your customers solutions that cut through complexity and clutter and are relevant to them, even at a local level. A powerful means of creating truly relevant retail experiences comes from asking your customers. That's the premise that Tom Jennings bases his 12/1-5/2008 Floor Covering Weekly article titled "Does one size fit all in your store?" He recommends finding out from your customers "what is it that turns ordinary product into extraordinary fashion" in their eyes. What a great question! Tom Jennings suggests "tour[ing] businesses successfully specializing in fashionable products not sold in [y]our industry." You see, most customers look for relevance to themselves, for something unique and in a retail setting that is comfortable from all perspectives [lighting, display, service, selection...]. Learn from others. 4. Don't expect a profit. What other approaches have you found conducive to creating unique, relevant, memorable retail experiences? This series started in June 2009 and gives me the opportunity to introduce you to my talented and fellow consultants at the Floor Covering Institute which has just announced the addition of Stuart Hirschhorn whom I interview in this post. 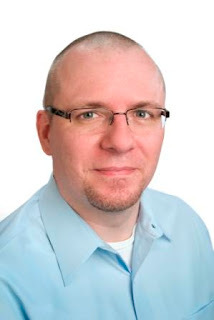 Stuart is director of research and founder of Catalina Research Inc., a name you surely recognize if you are associated with the floor covering industry, read the trade press and devour research on the industry. C.B. : Stuart, tell me about yourself. Stuart: With a degree in economics and marketing, I started at the birth of the information business working for a company publishing industry reports on a wide range of subjects. Over the decades, I became an expert compiling, analyzing, and presenting industry data and information to executives for actionable decision-making. In 1977, I started Specialists in Business Information (SBI) to offer executives this expertise worldwide. SBI was sold to a division of FIND/svp (now Guideline) that eventually became MarketResearch.com. In 2001, Catalina Research was formed to concentrate on publishing in-depth industry studies on the flooring, siding and roofing, plumbing fixture, and kitchen cabinet and countertop markets. A few years later, InformationGiant.com was established to provide an ecommerce platform for these reports. Clients can purchase on-shelf reports or they can sponsor a new report. C.B. : How did you get started in the Flooring Industry? Stuart: In the 1970s and the 1980s, I published separate reports on wood flooring, ceramic tile, and resilient flooring. In the mid-1990s, Floor Covering Weekly (FCW) approached me to provide a look at the entire flooring industry for their “Annual Statistical Issue” [Note: 2009 issue requires Silverlight]. Their request was one of the early attempts to quantify the entire flooring industry, and the FCW “Annual Statistical Issue” quickly became the statistical standard for the industry. At the same time, I began to publish an annual report on the floor covering industry covering total and segment market sales, the industry cost structure and company market shares, end-use markets and consumer demographics, the floor coverings distribution and installation businesses, and the factors driving U.S. demand. A few years ago, Sandy Montero, the editor-in-chief of FCW, suggested that Catalina Research provide an analysis of floor covering industry trends on a timely basis. The result was the Catalina Floor Coverings Quarterly Update. This timely newsletter quickly became a valuable planning tool for the industry’s leading manufactures and marketers. As the Catalina Research reports and newsletter became widely used throughout the flooring industry, I was contacted to present the findings of our research at industry gatherings. I have had the opportunity to present at Surfaces, the China Wood International Export & Import Conference, the National Wood Flooring Association Convention, and the Resilient Floor Covering Institute Annual Meeting. Stuart: I find the flooring industry fascinating to analyze since the competing material sectors - textile, wood, ceramic, vinyl, rubber, etc.- each have their own set of sourcing economics and each provide the consumer with a unique set of advantages. You can see this play out at Surfaces, where the different types of flooring are displayed side by side, sometimes even within the same company booth. It is also interesting how competitors use technology, in what could be a commodity business, to provide consumers with higher end looks and longer lasting and easier to install flooring. It has been very exciting to see how technological innovations have played out in the wood and laminate flooring sectors over the past decade as manufactures offered glue-less installations and pre-finished products. The past decade has also seen the globalization of the flooring market. When I first starting analyzing the flooring industry there were many regional players. Regional players became national suppliers, and now national suppliers are forming global distribution. Today, flooring materials are being sourced on one continent, manufactured in another, and sold in a third world market. Stuart: As in many other markets, the selling of low-priced, low quality products hurts the reputation of flooring materials. When I was in China, I was asked why Chinese wood and laminate flooring was considered to be low quality. The problem is the marketing strategy of Chinese manufacturers is primarily based on selling on price. However, eventually prices are lowered enough for the customer to question the quality of the product. I told the Chinese manufacturers they must develop brand recognition in order to convey the quality of the product to the customer. C.B. : Stuart, what five opportunities do you see in the flooring industry? 1. Market to the large population cohort that was born since 1975. These are the first time homebuyers taking advantage of the $8,000 tax credit and are the ones driving the recent increase in existing home sales. 2. Improve the quality of your lower end product lines to excite these younger buyers, who also have lower incomes than their baby boomer parents. 3. Expand international marketing to take advantage of the growing emerging markets. 4. Develop a global brand to bring meaning to your product line to the millions of consumers world wide entering the middle class. 5. Prepare for the turnaround in U.S. floor coverings sales in the second half of 2010 due to the rise in existing home sales in recent months. Some 10% of consumers purchasing a home today will be purchasing new flooring a year from now. Stuart: The Floor Covering Institute provides the industry with a one-stop consulting group that can assist manufacturers and marketers build their brands globally. C.B. : Stuart, is there anything you'd like to add? Stuart: Please visit our web site at www.InformationGiant.com to review the contents of the Catalina Reports and newsletter. Do you have questions you'd like to ask Stuart? Let me know. This week's guest for Flooring The Consumer's Social Media Series: Bridging New & Old is Roberta Rosenberg. Roberta Rosenberg, aka The Copywriting Maven, is an amazing woman. Not only does she know direct marketing and copywriting, but she also knows SEO and social media. She promotes all of these disciplines via her direct response, SEO and social media marketing consultancy, MGP Direct, Inc. Yes, she truly is a 'Maven' -- Yiddish for Expert. There's more. Roberta launched an online gift store in 1999, AdoptShoppe.com, and in 2003, the adoption and alternative baby book company, AdoptShoppe Press. Pretty neat. To me that says that she practices all that she preaches, and constantly tests, modifies, improves and retests. Roberta blogs at CopywritingMaven.com, writes the popular landing page makeover series at Copyblogger.com, teaches new copywriters for the American Writers and Artists Institute, and reviews children's books for Adoptive Families Magazine. Roberta's contribution to The Age of Conversation 2 - Why Don't They Get It? - the book that 237 authors from around the world collaborated on to benefit Variety, the children's charity [please consider buying the book] is "Another Tale of The Accidental Marketer - How A Broadcast Management Major Became "The Copywriting Maven." It's a great story that helps me better appreciate the unbridled enthusiasm that Roberta so readily shares. C.B. : Roberta, how/why did you get involved in social media? Roberta: I think I've been involved in social media for the past 20 years. I had the great fortune to be one of the creatives behind the launch of GEnie, one of the first online networks in the mid 1980s. Being able to chat and interact real-time with others worldwide, even in its primitive '80s technology trappings, was amazing. I knew early on that connecting people with people in real-time without concern to geography, timezones or other artificial barriers was really what the web was built for. Being part of the web’s early evolution from a hobbyist's plaything to a global driver of ideas, education/training, commerce, friendship -- and even romance -- still enthralls me. I can't help but be excited about what else lies ahead. As far as what we mean by social media now, I came to it a little late, I'd say. In early 2006, I started to explore blogging as an extension of website work I had been doing for nearly 10 years. I found and followed up-and-comer marketing folks who were doing and saying some interesting things. Within a few confidence-building months, I started my own blog, The Copywriting Maven (copywritingmaven.com) as a personal "lab" that I could tinker with. Soon after, I added LinkedIn, Facebook and ultimately Twitter. The latter, of which, I had some initial reservations about but now use and recommend regularly. Roberta: There are probably three main factors to my social media enthusiasm. I love the speed in which information can be shared intimately between 2 people or globally with 2 million. I also like the borderless nature of social media. As I already mentioned, you're not restricted by where people live or work or what their time-zone is. Like a constantly flowing stream, you can dip in and out with ease, when and how you want. Lastly, social media provides consumers and businesses with unprecedented opportunities to connect on multiple levels both large and small. You can quickly assess trends, solicit opinions, get recommendations, address critical concerns, or even share a laugh with a goofy story or video. As my grandmother might say, "What's not to like?" Roberta: What is the flipside of virtue? What do we lose for every gain? I think the speed and facileness of online social interaction can too easily blunt the value of context, thoughtfulness and nuance. Like the difference between a news headline and a single story deeply analyzed, we click and send ... click and ship ... click and friend - but do we think about it? Interactions are many, but genuine engagement of heart and mind? I'm still mulling that one over. I’m also thinking about what defines relationship vis-à-vis the social media. We may have 5,000 Facebook friends or Twitter followers but how well do we really know each other? For example, I now have clients all over the world as well as in the Washington DC area where I live. I don't expect to see clients who live in Australia, but I rarely see clients in person at all anymore for no other reason than we're all busy and online interaction is more efficient. As a species we're hardwired for face-to-face contact. So I wonder as more of our personal and business relationships are conducted online what ultimate price we pay when we sacrifice inexact, sloppy, face-time intimacy for razor-sharp efficiency. Lastly, social media all too easily crowns celebrities and experts. It reminds me of the "As Seen on TV" red badge. If someone is on TV and/or online enough, they can get a credibility gloss that may or may not be earned. Of course, it works to someone's favor when they're genuinely and knowledgeably fabulous and deserving of, um, Mavenhood-status. Roberta: This is an easy question. It's changed EVERYTHING, but I say that with a caveat. I come from a direct response marketing background. (I'm not only a direct marketer but I'm a direct marketing consumer, as well.) So as a consumer, it was easy for me to move seamlessly from being a big catalog consumer to a big online consumer, especially for niche, hard to find products and services. This was one of biggest drivers behind my interest in experimenting with ecommerce in the late 1990s. I saw it as a direct line extension of the catalog experience. So the shopping didn't change -- just the medium in which the shopping was performed and transacted. The trick was to replicate the personal, tactile experience of shopping offline to the online environment and perfect it. Another area where social media has changed EVERYTHING is how consumers are now interacting with companies (and we thought toll-free 800#s in the 1980s were a big deal!) Consumers are getting hip to their power. Smart companies know it, too. Rather than brushing off consumer complaints with an eye-roll and half-hearted, "We’re listening" response, companies are listening, blogging, Twittering, and taking quick action -- emphasis on the quick. This, as Verizon's FIOS advertising likes to say, is big. Everyone gets a win-win here. 1 - Be where your customers not only want you to be, but expect you to be. Then delight them when they find you. A website that's clean, informative and intuitive. A well-written blog with style and heart. Tweets that deliver more than self-congratulatory promotional hoo-hah. I'm thinking Zappos 101. But don't leave traditional media behind if your market still uses and trusts it. It's really all about 1 + 1 + 1 = 1 great message. 2 - Don't let the technology drive the message: Too many companies fall in love with the latest and greatest tech-delivery toys and the ultimate marketing message gets lost in the noise. Think people, think message and then think the best, most effective ways to connect the dots between the two. 4 - Embrace the fact that all consumers have access to their own digital bully pulpits and aren't afraid to use 'em: Consider the super-heated blogger blaze that forced Tropicana to return to its classic straw-through-the orange package design or how raging Mommy Bloggers laid waste to Motrin's recent marketing debacle. Listen and learn. Act and respond. 5 - Remember the power of a simple phone call or a hand-written letter: Years ago before I opened my own little marketing shop, I was the Account Executive for a direct marketing agency; Special Olympics was my account. One of the SO staffers shared with me that every week without fail, Eunice Kennedy Shriver, then the Executive Director, would personally call every super high-dollar donor to thank them for their support. Today, just imagine the impact that kind of personal gesture might have on keeping donors happy and donor dollars flowing. Roberta: Think 40%/40%/20% for social media messaging: inform and solve/share and surprise/promote and publicize and let the optimal mix of people, market and message drive the delivery technology. Lastly, don’t forget to push away from the tools and toys and meet your customers and friends for a little face-time. + "Social media provides consumers and businesses with unprecedented opportunities to connect on multiple levels both large and small. You can quickly assess trends, solicit opinions, get recommendations, address critical concerns, or even share a laugh with a goofy story or video." + "Consumers are getting hip to their power. Smart companies know it, too." + "... Delight them [your customers] when they find you... But don't leave traditional media behind if your market still uses and trusts it. It's really all about 1 + 1 + 1 = 1 great message." + "Remember the power of a simple phone call or a hand-written letter" [which must have inspired Small Gestures That Communicate Strongly]. + "Think 40%/40%/20% for social media messaging: inform and solve/share and surprise/promote and publicize and let the optimal mix of people, market and message drive the delivery technology." What did you identify with? You see Jon immediately began talking to me about Dornbracht's 'spirit of water' and not about kitchen or bathroom fixtures. He spoke of the experiential nature of what the products enable and then the strong design sense and commitment of the company. He described these fixtures as design elements. 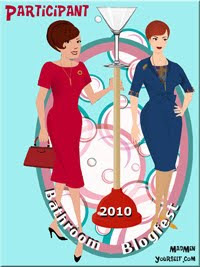 What came to mind was a post I wrote back in August 2006 about the Water Droplet Girls and transforming faucets into fashionable items. This conversation though went much further because it highlighted what my friend Chris Ramey forever chastises me for when I say that flooring is fashion. He reminds me "Christine, Flooring isn't fashion - it is design. Fashion is a subset of design. It's an important difference." These Dornbracht products as Jon described them and the company philosophy truly were design elements and not fashion ones [e.g., Check out ModerneMama's description of the Champagne SuperNova from Dornbracht], reflecting the company's design sensibility and commitment to culture. Explore the website and you'll come across some of the culture projects the company supports: Global Street Food at Art Basel, Noises for Ritual Architecture, the Farm Project, Energetic Recovery System, 3 spaces in one, bath modules, conversations, ... and even more Cultureprojects by Dornbracht. Given the commitment to culture and design, I wasn't at all surprised to learn that the company, although it distributes products in the United States and Canada, is an almost 60 year old German company, founded in 1950. Given that same commitment to culture and design, I wanted to experience more of the Dornbracht Spirit of Water sensibility - it's so different from what we are used to in the U.S. - at the Bloggers Bash I attended. That's when I met Jon Spector back in February during an event hosted by Veeder + Peerman and sponsored by several home-related organizations: Allsteel, Villeroy & Boch, Karastan, Dornbracht, Benjamin Moore, and Wii [yes, Wii]. I was invited to attend as a home-related blogger [because of the Carpetology Blog] and also got to spend time with some of my Karastan friends [at the time, my Wear-Dated customers]. Jon was the first person I met. I have been thinking about The Spirit of Water ever since, wondering how to transform other basic products into comparable transformative experiences. Take flooring. How would you capture what it enables? Soft surfaces re-energize, don't they? And dance surfaces celebrate life. No? Michael Cheek from Mohawk is definitely Flooring It Differently! He came up with the concept behind the Ricko the Rhino SmartStrand Challenge, an ultimate test in carpet durability [i.e., think rhinoceros on carpet for 2 weeks]. What's particularly fascinating about this campaign is that it includes elements of social media. More specifically, Twitter, YouTube and Facebook - a first in the flooring industry. I caught up with Michael on Twitter [@MichaelCheek] and he graciously agreed to answer many questions about this challenge here on Flooring The Consumer. He shares with us an insider's perspective on the overall program and on integrating new social tools with traditional ones. C.B. : Michael, please tell me about yourself and your role with Mohawk. MC: I’m the “web guy” for Mohawk’s Residential Division, meaning I’m primarily responsible for the websites our consumers and retailers access for product information. Most consumers would probably recognize MohawkFlooring.com. MC: Mohawk is the world’s largest manufacturer of flooring including carpeting, hardwood, laminate, ceramic tile and area rugs. C.B. : So, what is the Ricko the Rhino challenge all about? MC: For the last few years, Mohawk manufactured a carpet with the name SmartStrand. It’s a remarkable carpet since the molecular make-up of the carpeting fiber prevents staining. It’s so incredible that you can pour bleach on it and the carpet won’t even discolor. Moreover, this carpeting uses corn sugar to replace some of the petroleum-based ingredients so it saves energy. It’s incredibly durable and amazingly soft. So we wanted to show the consumer just how extraordinary this carpet can be with the most extreme test we could conceive. Let’s be honest that the economic conditions make for a challenge unto itself. While we were working through the details of this ultimate test, Mohawk saw more opportunities. Along with SmartStrand’s inherent sustainability message, we could call attention to the plight of an endangered species, like the Eastern Black Rhinoceros. Less than 500 of these majestic (but very messy) pachyderms remain in the wild. Additionally, we felt this entire effort belonged on the web, so we incorporated the live web cams and a strategy to embark into social media. C.B. : Why did you decide to include social media? MC: There’s a saying: “Fish where the fish are.” Many corporations are venturing into the social media space because that’s where millions of consumers virtually congregate. That’s enough justification for some. In my professional opinion, that’s just a small portion. You can’t go fishing without the right equipment and the right bait. For the flooring industry in particular, ask any retailer and he or she will tell you the most powerful advertising tool available is word of mouth. Today’s “word of mouth” advertising is beginning to shift toward the online realm, in particular the “social media” services like Facebook. Additionally, corporations and social media speak two different languages. By the very nature of the word “social,” it requires a level of personality and agility that many corporations do not quite know how to utilize. Having a celebrity like Ricko the Rhino allowed Mohawk to speak with consumers in a meaningful and fun way. C.B. : What are the social media elements you’ve incorporated? MC: We focused on three primary outlets: Facebook, Twitter and YouTube. Each has a so-called official Mohawk element and a fun Ricko the Rhino persona. The official Mohawk version began a dialog with retailers and other industry professionals. Ricko focused on chatting with consumers, particularly those with kids. C.B. : Why did you select them? MC: We did survey visitors to our websites during the summer to determine what best matched both consumers and retailers. Generally, the results were about the same. Facebook proved to be the most pervasive, as I expected. YouTube and Twitter were a bit more specialized. Since this was a compelling story told best through video, YouTube was a natural fit. Twitter is the unknown and experimental piece of the puzzle. But Twitter has a very loyal and dedicated following, so the people involved with Twitter could bring fierce loyalty to Mohawk as a brand. C.B. : What did success look like at the beginning? MC: Success in social media isn’t the same as with a website, which looks at the number of visitors, time spent on a site and a few thousand more numbers. To be honest, I don’t know if anyone has quite figured out the right way to measure success in social media. Certainly, the firm numbers always look good — so many followers or fans or viewers. What I wanted to see more was the level of engagement. How many people posted questions or responses? What kind of postings? Was there commentary, opinions or just a repeated posting? C.B. : What did you decide to measure? MC: I tend to be very observant of the overall activity. Of course, everyone loves the exact numbers. Right now, Ricko can post almost anything and get an average of eight responses on his Facebook page. Additionally, when the challenge came to a close, many people just begged for it not to end. So many anecdotes emerged from this event. For example, a first grade class that watched Ricko each and every day. While that’s a little heartwarming to me, I can be a crass businessman and say each one of those 20-plus kids in that class has a parent or two who heard about the rhino living on carpet. If just one of those parents — and I bet there were more — investigated, we will have a consumer thinking about how SmartStrand might fit into their home. What it finally boils down to is those fiercely loyal fans that will generate the “word of mouth” advertising and become natural Mohawk advocates. It’s a long-term success strategy that will pay off as the economic doldrums subside and more consumers go flooring shopping. They will ask for SmartStrand or “that carpet the rhino lived on.” And that’s carpeting you can only get from Mohawk authorized retailers. There’s no measuring that directly but an indirect response is a boost in sales over time, increased recognition of SmartStrand and improved acceptance for SmartStrand as an alternative to the other fibers that have been available in carpeting for decades. C.B. : What did success look like at the end? MC: It doesn’t end. While the SmartStrand Challenge time did conclude, we still have videos to post, tweets to write and Facebook fun to generate. The campaign will wind down and transition. I might add that Mohawk did not plan this event as a one-off. There’s a larger strategy going into the annual fall sale and beyond. To me, some of the activities coming down the pike are bigger than a 2,800-pound rhino. C.B. : What were the biggest surprises you encountered? MC: I came into this effort without many preconceptions, including on the social media portion. I don’t think anything surprised me or anything unexpected occurred. We have a very good organization, worked with a terrific agency and had full cooperation from the Birmingham Zoo. All that went into a good plan that seemingly went well. If I had to point at one thing, I did expect more inappropriate postings. I’ve spoken with several other large corporations like Mohawk who have been in the social media space much longer. Many have to put a significant effort behind assuring the postings are family friendly. C.B. : What are you most proud of with this campaign? MC: When the marketing organization began revealing the details of the SmartStrand Rhino Challenge to the Mohawk sales force, we received an e-mail from a long-time employee. At a company like Mohawk steeped in tradition more than a century old, you don’t often expect for your sales force to gush with excitement. This gentleman did. He wrote a very kind note that will stick with me. C.B. : How have the social media elements helped the traditional elements of the campaign? MC: At this point in time, any social media is an enhancement and rarely required. Corporations need to experiment and figure out what works best in these mediums. I do know that we probably exposed more people to SmartStrand and we did so at greater speed. In a traditional campaign with the same dollars, I doubt we could have pulled sufficient attention to SmartStrand, especially with Mohawk’s target audience. C.B. : What about the black rhino message? What should people know? MC: First, I’ve got to tell you about Ricko. I met him back in early March. While I can tell you about the personalities of my own dogs and cats, I never thought of zoo animals having personalities as well. Ricko does. He’s like a puppy, but a lot messier. He can be stubborn and shy. Getting to know this beast helped us get to know — and care — a lot more about his species. Ricko, more than anything else, turned out to be the best ambassador for Black Rhinos everywhere. Despite the fierce appearance and the defensive characteristics, rhinos are remarkably gentle and kind. With so few left in the wild, it became important for me personally to help Ricko and his extended family. So we were able to add the preservation portion of the campaign, asking people to purchase a special t-shirt and stuffed animal. Any proceeds would go to the Birmingham Zoo and the International Rhino Foundation. C.B. : You now have many Ricko the Rhino Facebook fans [2210 as of 9/9/09], Twitter followers [234 as of 9/9/09] and others. What will you do with them? MC: Ricko will hang around for a while. We’re hoping there’s a natural transition toward joining Mohawk’s social networks and participating there. C.B. : How do your Facebook, Twitter, YouTube and other audiences differ? Are they consumers? Retailers? Other? MC: We can make a few educated guesses but nothing is exact. Facebook is the most varied audience with kids, teenagers and adults — including a huge portion of our target consumer (female, 35 to 65, married with kids). Twitter tends to be more retailers and sales people mixed with a few cutting-edge consumers — probably a little young for our target, but still good to influence. YouTube is a huge mixture but it gives such a more compelling story that viewers are more likely to become loyal fans. The social media space could make you strive to be everything to everyone, but if you provide that compelling story along with rich interactions, you can be assured of finding — and keeping — those with the most interest. C.B. 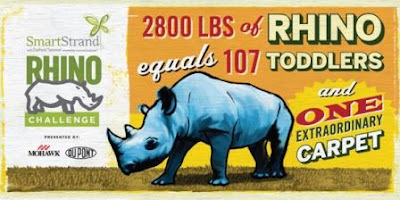 : In a FloorDaily interview, David Duncan and Bart Rich explained to Kemp Harr how Ricko the Rhino will be incorporated into retailer newspaper, TV ads and POP kits. What about the social media elements? How do you integrate those? MC: In this particular case, I think it’s the opposite question. How will these more traditional means of advertising complement the social media elements? While ads and POP kits were discussed and planned for at the beginning of this project, the demand that surfaced from our retailers cemented the need for more traditional support. C.B. : How are you seeing the retail marketplace getting involved with social media? Both in terms of retailers and consumers. MC: Consumers — most especially those 40 and younger — have embraced social media with great favor and speed. But overall, it’s still a young medium. I think we’re seeing more and more people use it. Some of our retailers are using the online space effectively. Still others are just getting comfortable. But since social media is merging into the mainstream, I think you will see more and more step into the space easily. And my recommendation doesn’t require anyone to be aggressive. They should just be there as a way for consumers to connect. Over time, it will happen more and more. C.B. : Do you anticipate doing more with social media going forward? What makes the most sense for Mohawk? MC: Absolutely. We’ve just started to tell the story about Mohawk and our products. C.B. : How do you use social media on a personal level and for your role at Mohawk? MC: Being that I’m pretty much a geek and admit it freely, I have something like 20 different e-mail addresses, six of which I use on a regular basis. It’s the same in social media. But I think the distinction between what’s personal and what’s professional has blurred with Facebook and Google overall. You can see my entire career in a Google search! Still, I feel more connected with people via Facebook. I learn what they’re like as people — not just workplace familiarities. It actually brings a dimensionality to people that breaks down the walls between work and home, who you were in high school and who you’ve become now. I know it sounds a little strange to those who resist social media thinking that it’s impersonal. I find things more personal and much more connected. C.B. : Michael, how best to connect with you? Of course, all of the Mohawk fun can be found here…Mohawk Flooring, on Mohawk on Facebook, Mohawk on Twitter @MohawkFlooring, and on the Mohawk YouTube channel. And, look for Ricko the Rhino on Facebook, Twitter and YouTube, too. Thank you, Michael, for sharing your insights with us! How would you apply Michael's observations to what you do? How might you integrate social elements into your overall marketing strategy? For more perspective on the SmartStrand Ricko the Rhino Challenge, view TalkFloor TV's series of interviews.